Scene of the Blog Featuring Vivienne of Serendipity Reviews! This week's featured guest has been blogging since 2009. Vivienne is a former teacher who is working toward being a published writer. While she does that, she and her husband are raising two children, and Vivienne is dreaming of sunnier climes than England. Her blog, Serendipity Reviews, is a nice mix of all things bookish, especially those with a Young Adult, Paranormal or Contemporary twist. Of course there are other things on the blog as well, and one of my favorites is a series of posts called "Life As We Know It." If you're not familiar with Vivienne's blog, I hope you take this opportunity to pay a visit and say hello. If you're visiting from Serendipity Reviews, welcome! Thanks for stopping by to take a look at where Vivienne does her blogging. If you'd like to see any of the photos in a larger size, all you have to do is click on them. She's ready to give us a tour now, so let's not keep her waiting! Welcome to my home, please do wipe your feet on the mat and make yourself comfortable, whilst I babble about the scene of my blog. My desk is situated in my front room. I know that must sound mad, but my front room is huge and we needed something to take up the space at the back of the room. Not to mention the fact that I spend far too much time on the PC and my family would probably never see me if I had my desk in my husband’s office. I am extremely anti-social when I am on the computer! Even though I have a laptop, I very rarely move it from my desk. 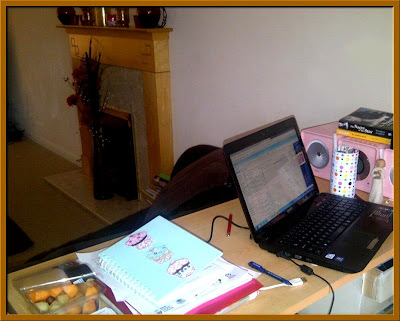 When I sit in my chair that is my time to blog, email and catch up on Twitter When it comes to reading, I normally sit on the sofa in front of my desk. It really is comfy, sometimes too comfy and I often fall asleep. I have a separate old computer without internet access where I write and edit, as my dream at the moment is one day to be published. If I used the same computer for all, I would never write a word. That hides away on my dining room table. I tend to spend the day moving from one to the other and back. I was going to tidy up, but then I thought that wouldn’t show the real me! I am a messy pup when I am blogging. I have endless notepads strewn everywhere. I have notebooks for everything. One for future blog posts or theme weeks; one for my To Do list as well as a diary. I keep buying more and more, much to my husband’s disgust! Normally I have some snacks around to keep me going and because I am too lazy to keep going to the kitchen. I have hidden the chocolate and just shown you the fruit. Don’t want you to get the wrong idea about me! When I write or blog, I have to have complete silence. 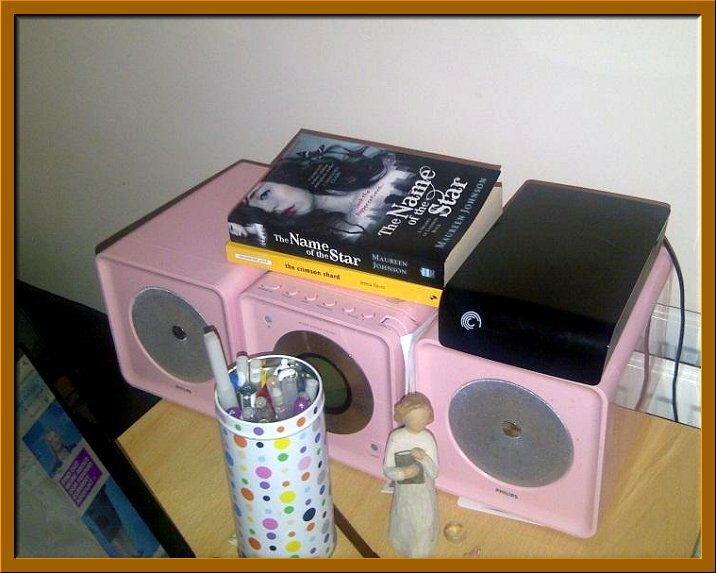 I don’t like the television or the stereo on, even though hubby brought me this squiffy pink one. I very rarely use it, apart from storing my books on it that need to be reviewed. I keep my angel beside my computer as I have a thing for angels. Unfortunately she has lost her wings, so she looks more like me with a book. Eep! Jake and the "printer shelf"
As you can see my dog, Jake keeps me company whilst I type. Normally he just lays there, sleeps and blows off, but company is company. Bless him, he is rather old, so I will forgive him, his procrastination and bad habits. 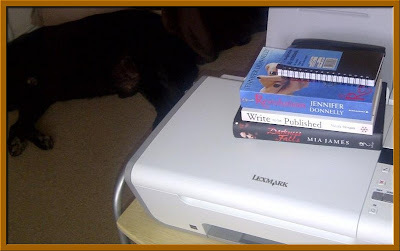 My printer is normally used to hold the books I am reading at present. I like to have them to hand and very rarely print anything these days, so a shelf it has become! Beside my desk I usually keep the new books that have entered my house that week. Yes, I did say that week! Normally up to ten books can arrive at my house. These will either be review copies, charity shop buys or books from Amazon. 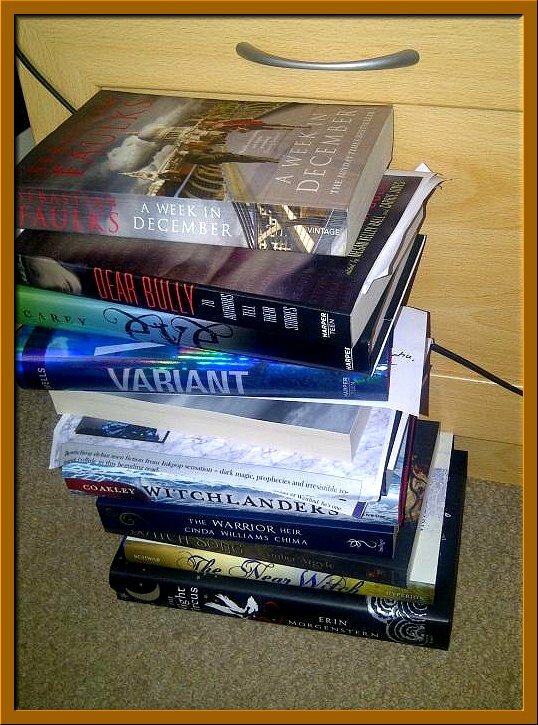 I am lucky as I get a lot of review books from publishers, although I do struggle to read them all. Once I have done my IMM vlog, I move them upstairs to my book cases. So that is the scene of my blog. I hope you enjoyed your tour. Please close the door on the way out, don’t want to get a draft-- and I must finish that blog post! 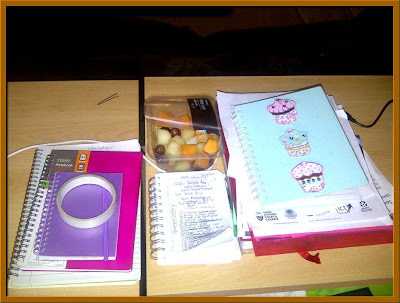 Thank you so much for giving us this glimpse into your creative spaces, Vivienne-- and we promise to tell no one about that hidden chocolate! I'll just give Jake a good scratch behind the ears before I let myself out. Ta! 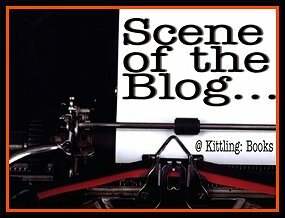 Thanks Cathy for featuring my 'Scene of the Blog' today. It looks fabulous. Your work space looks lovely, Viv - much tidier than mine. And I'm glad to hear the chocolate exists, even if it is hidden! Emma - you wouldn't say that if you saw it now. It has changed completely since I did this post as I have now moved into my husband's office. He got fed up of me being in the living room! 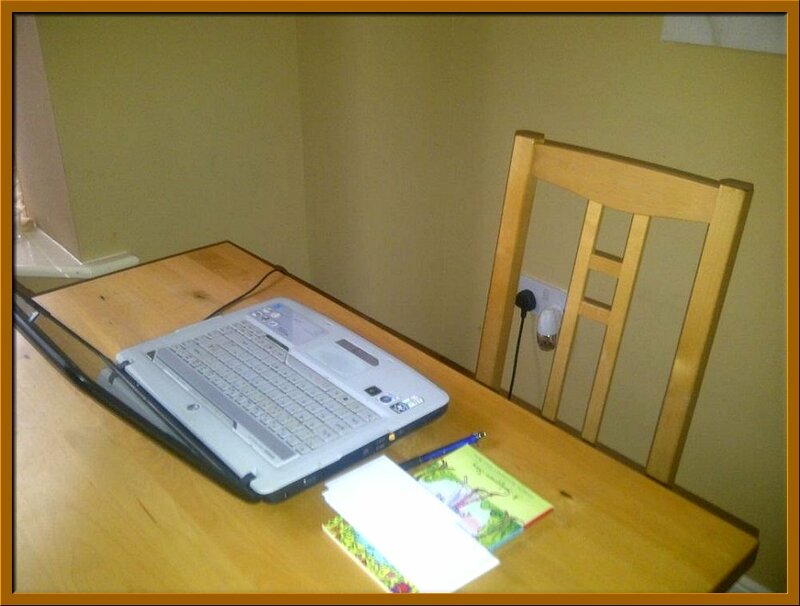 Good to be able to picture you as you sit blogging. What a warm, comfy spot you have and your dog looks to be the perfect blogging companion as you know he is there for company and yet he makes no demands. Printers make great shelves. Ours is overloaded at the moment. Reminds me that we should probably clean off some of that stuff. Fun visiting with you, Vivienne. I love Vivienne and loved seeing her space and discovering that we have a lot in common. I like the quiet too and our old dog keeps me company while I'm on the PC - she's currently sleeping away in her chair in this room. Petty Witter - He doesn't do a lot these days. Quite an old dog, bless him. Kaye - I have to keep clearing it off to make way for more junk! Bermudaonion - I love you too! So neat and uncluttered! My place is so 'full' of stuff! I too have a faithful friend, Wendy our black lab, that lays under my desk on my feet when I blog. She is 11 and her mum is 14! Peggy - oh bless. Jake is 15 and still going strong. He has a bit of arthritis but he won't give up. So nice to see where Vivienne blogs. And Jake looks like perfect company. SO tidy Vivienne, I am moving my clutter around here in embarrassment! Had to laugh at your stinky dog. Mine drop stealth bombs. You don't know they are laying under the desk until you wake up on the floor having passed out at the eggy stench. I am the exact opposite--I have to have some sound when I blog. Usually I have the TV on. I don't blame you for using a separate computer without internet to do your writing. I don't think I could get a word written with Twitter as a distraction! !